After last week's double elimination, the tent is down to seven bakers. This week their challenges start triangular (samosas), go round for the technical (puits d’amour) and then go spectacular for the show-stopper (a shaped pie fit for a banquet centrepiece). So, goodbye Dan. 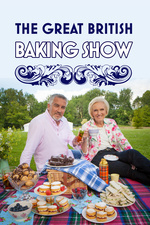 Past the half-way point of the series, and by this stage all it needs is a couple of weak bakes for even the hitherto strongest of bakers to come unstuck. Disastrous samosas, 6th out of 7 in the technical and a signature that was impressive but underbaked left him just too vulnerable. Manon didn't have a great episode, but nothing of hers went flat-out wrong. And Briony got star baker! Looking at the progress chart on Wikipedia's summary of this series, I don't think I've ever seen a baker be on the verge of elimination for for weeks in a row and then come back so strongly. Much as I really liked her, I was on the point of classing her as one of those GBBO bakers who can't quite bridge the gap from 'very competent' to 'genuinely talented', but it looks like I was wrong. Can she keep it up though? Briony's starring performance had the odd effect of to some extent masking another very mostly episode for Ruby. In the first few episodes she came across as a naturally inspired baker who was just bad at time management. But over the last couple of weeks she seems to have got over that; but for the problems with her technical, I think she might well have picked up star baker. Personal highlight of the episode: Kim-Joy's samosas with Pythagoras' Theorem on them, BECAUSE KIM-JOY. Aargh, should be "another mostly very good episode for Ruby". Rahul's refusal to say which of the other bakers is his favourites is quite sweet. He is an absolute Dormouse, but he seems genuinely sweet and anxious, rather than passive-agressively damp. And the samosa angst was amusing. But oh, I have never missed Sue and Mel as much as for Wells of Love - they would have been rolling on the floors over the terrible puns they'd have made from those pastries. Dan, nooooo. :( I mostly appreciate that the judging is pretty strictly week by week, but that was a heartbreaker. We've reached the point where every elimination is a stab in the heart, and Dan really just didn't do well. I loved him so much, just because he reminds me of me so much. Ruby has grown on me totally. I love how snarky and good-naturedly bad-natured she is. Just like snarking with a good friend. Briony is having so much fun, I can't not smile when I see her enjoying the whole process. That Mad Hatter pie was a work of art, for sure. Aw, Dan. Even though I know this is where the show goes from where I'm sort of cheering on the eliminations to being heartbroken by them, it's always sort of a surprise to look at the field and realize you're going to miss any one of those personalities when they're gone. It was something that Briony's pie sort of overshadowed whatever weirdness Kim-Joy got to this week. Oh right I was so scarred I'd forgotten about Jon's eggwhite drink until this morning. I mean I know people who do it but _gah_. Just thinking about drinking egg whites (the slimy texture!!) makes me gag. I wish they'd cut that part out. Oof. I'd have pegged Jon to go out before Dan given past performance -- Jon's got a lot of neat and clever ideas (like his various gelatinous spheres), but he's had a few heavy/dense/unsuccessful bakes. Dan seemed weirdly distracted or off his game this week, though, in every single bake. I wonder if he felt intimidated by pastry from the start and it became a self-fulfilling prophecy? I always felt like Briony had it in her, and I'm delighted she got Star Baker. ~*Mad Hatter Pie with playable hedgehog croquet lawn*~ is out-Kim-Joying Kim-Joy territory, and even the filling sounded delicious. I'm rooting for a Rahul/Briony/Kim-Joy final, myself, though everyone this season is so darn likeable it's sad to see anyone go. My partner, who has never baked anything, now desperately wants to try puits d’amour, and is insisting "I want to do it myself!" despite having seen the carnage this week's Technical wreaked even upon the experienced GBBO crew. I have baked enough to know how this is probably gonna end. I am preemptively taking the batteries out of the kitchen smoke detector. God help us both. I am slightly nervous by the glitterization and edible airbrushed coloring this season - sooner or later it's going to end up being all YouTube cooking show barely edible decorations instead of ... eh, what it's been. Traditionally decorated, let's say. 1. He encourages the other bakers, asks how they're doing, and lends a hand when they need help. 2. His bakes are often done with his wife and kids in mind, like this episode's samosas, or the tutu he wore to present the dessert inspired by one of his daughters. 3. He has a fun, easygoing rapport with everyone in the tent. His camaraderie with Dan was refreshing and its absence will be noticeable. 4. He rolls with stress really well. I wish I was a fraction as calm when under pressure. 5. He compared pastry to heavy metal. Oh my. Now we're getting to the part of the show where anyone having a bad week can leave the tent, and I can see nearly everyone left as worthy of making it to the final or the semi-final. Otherwise, I generally like Pastry week. Pastry is fickle and fiddly, and really seems to make or break bakers. But the bakes this week seemed ingenious, and the challenges were difficult, but not ...overly ridiculous. It was a really good episode, and it seemed like a great way to slide us into the second half of the show, where things get more and more out there. Vegan week looks very, very interesting! Really happy for Briony, she had a really good round. I want to go out for drinks with Ruby. Rahul continues to be a wet blanket. I loved Kim Joy's mermaid although I was a bit disturbed with the idea of cutting into it to eat it, even if it was veggie. My one word reaction to Dan's grey fish pie: "Gads." Poor Dan. Briony's pie was amazing, but surely it should have been rabbit, not venison! A couple of weeks late, but I finally managed to get around to doing the Puits D'Amour. And they came out fine! Not too difficult, except that we couldn't be bothered with ordering nibbed sugar (not readily available in even large supermarkets) so I just dusted with a little caster sugar instead before baking. Nothing in the recipe is actually that difficult if you have comprehensive instructions and no time pressure. In particular, I did the puff pastry, compote and creme pat yesterday and then the choux pastry, baking and assembly today. Also late to the watching; this was the first episode where I actually liked the intro (of Noel in the tent "with" all the other contestants). I also liked the "here is a bun, and it's both angry and uncomfortably warm!" interaction, and the flying saucer eating. Obviously I don't know the guy, and I am fully prepared for him to be Milkshake Ducked as soon as I post this comment, but if you ever want to show someone what non-toxic masculinity looks like, Jon's not a bad example.